Sixteen year old genius Anthony 'Tony' Stark is locked in a ongoing but loving invention battle with his brilliant father and Stark Enterprise founder Howard Stark. Unfortunately during a visit to a archaeological site, Tony & Howards plane crashes, killing Howard, and leaving his son Tony with a heart injury requiring him to have a rechargeable magnetic plate inserted into his heart. As his fathers last wish, Tony is sent to live with his best friend James, and go to High School with him to help Tony normalise to the everyday. With Tony still being two years of turning eighteen and Howard having passed on, Stark Enterprise is taken over by Obadiah Stane, a money hungry executive hell bent on using Starks inventions to create weapons for the highest bidder. Even after confronting Obadiah to get copies of his father's work so that he can continue it, Tony is refused, leaving him with just his last created invention, a 'Stark Exo-Suit'. Tony is soon met however by a fellow school member Pepper Potts, the daughter of a FBI agent investigating the alleged accident of Howards death. After Pepper suggests that the plane crash was no accident and possibly incident by Obadiah, Tony starts to pull the pieces together and begins to rebuild what happened to his father and how to get Stark enterprises back. The original Iron Man series had some pretty unashamed adult themes which obviously wouldn't transfer too well to a children's animation. In watering down those elements and showing a younger Tony Stark, Marvel have created a new fresh look at the Iron Man story. Each episode runs well and comes off the same way as reading a Iron Man comic book. There are a few disappointments, such as the misuse of evil villain Mandarin and supporter Pepper Potts. The animation, based in 3D CGI drawings adds a exciting edge and has been done with such a quality as not to look cheap and thrown together, as so many 3D CGI animations can. 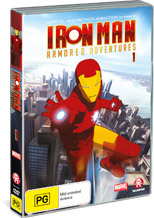 Overall its a great and exciting fresh take on Iron Man that kids and parents will enjoy.